← Look, We’ve Got A Heartbeat! Felix Frankfurter, You Are Outta There! Lifetime tenure for Supreme Court Justices is another of the ideas from 200-plus years ago that might well be adjusted if Madison, Adams, et al had a chance to re-do the Constitution in light of current circumstances. It is inconceivable that people as practical-minded as they would have come up with today’s “two Senators for each state” model, California and Wyoming alike, which contributes to the paralysis of the Senate. (As argued here; main point is that when the Constitution was agreed to, the states were much closer in population size, rather than the 70-to-1 difference between today’s most and least populous states.) And they might well have rethought the wisdom of open-ended places on the Court. Average life expectancy at birth during the late 1700s was 30-some years, versus 70-some now. Of course that figure is misleading, since so many people died very young — and those who reached age 50 often chugged along into their 80s. Still, circumstances have clearly changed. Part of the thick academic literature on the topic is a Harvard Journal of Law and Public Policy article (PDF here), which points out that from the founding of the Republic until 1970, the average tenure of a Justice was under 15 years; since then, it’s over 26 years. As a result, actuarial considerations have become fundamental to the modern nominating process, to what the Founders would recognize as a distorting degree. It is a “wasted” appointment to choose someone over age 60, since a nominee in his or her 40s (Clarence Thomas, age 43 when chosen) or early 50s (Elena Kagan, 50) can likely cast that many more votes over the years. The idea that we’re locking in policy for the next three or four decades makes the confirmation process all the more embittered and partisan — and dishonest, as nominees, whether John Roberts or Elena Kagan, pretend they have no settled views. Older and ailing Justices may hold onto their seats unnaturally long, too, if the “wrong” party controls the White House. “We believe the American constitutional rule granting life tenure to Supreme Court Justices is fundamentally flawed, resulting now in Justices remaining on the Court for longer periods and to a later age than ever before in American history,” Stephen Calabresi and James Lindgren, authors of the Harvard Journal article, say. I agree with them too. This is not a new idea, and like many other Constitutional adjustments it’s probably not going to happen. But we’d be better off it if did. Second, justices tend to serve short terms because of illness and death in many cases but, in others, because of higher ambition (John Jay), dissatisfaction with the job (Jay again, also Minton), and occasionally scandal (Fortas). …structural changes in the justices’ working conditions, such as the elimination of circuit-riding and the expansion of support staff (secretaries, marshals, and law clerks), as well as more favorable retirement provisions. 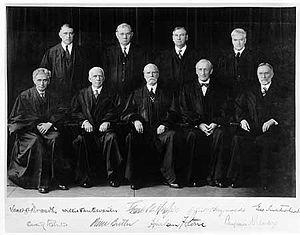 …while the Court’s workload has decreased, the significant expansion of certiorari jurisdiction has meant that the justices’ control over it has increased, thereby allowing the Court to focus its attention on constitutional issues of broad national significance…the justices have assumed an increasingly prominent and meaningful role in core aspects of American political life. To the extent that these issues are controversial among the public and politicians alike, they are no less so among the justices. As a result, on a closely divided and ideologically polarized Court, one vote can mean the difference between upholding and striking down laws that implicate foundational constitutional and democratic values. Simply put, justices have more power and prestige than they used to. No wonder few want to leave the bench quickly. But is this really a problem? Crowe and Karpowitz find it hard to muster an easy case for term limits. On the one hand, more frequent rotation through the Court could make it more accountable — i.e., closer to the public. On the other hand, this presumes that the Court should hew toward the majority’s will, and that is a problematic criterion. And, in any case, the Court is often sensitive to public opinion, even when composed of long-serving justices. Other advocates of term limits argue that they would reduce the divisive politics of Court appointments. This is the motivation for Fallows’ post. Crowe and Karpowitz are skeptical, and I tend to agree. I doubt that presidents, Senators, interest groups, and others would suddenly stop caring as much if justices served only 6 or 8 or 12 years. A lot of the divisiveness stems from party polarization in Congress, which is not likely to go away anytime soon. Under term limits, I would foresee an increasing number of equally divisive Court battles. Indeed, they might become even more divisive because leaders would know exactly when vacancies would arise, making them even more a dominant consideration in campaigns. I tentatively disagree with John on this one. It’s not that I think any of his points are wrong, exactly, and I’m sure that John is much more knowledgeable about the political science literature than I am. It’s more a matter of emphasis. One thing I’ve noticed over the years is that political scientists, at least those studying American politics, are often skeptical about proposed reforms, perhaps in reaction to the overselling of such proposals by activists. Any changes in the tenure of justices over time is not due to an increase in the number of justices serving long terms. There have always been those justices on the Court. Instead, there has been a decrease in the number of short-term justices. That’s fine, but it doesn’t at all counter the argument that term limits will reduce the long terms. Justices have more power and prestige than they used to. No wonder few want to leave the bench quickly. This makes sense to me, and it seems related to the general pattern in our society that life is getting better for people at the top. I agree with John that this is evidence neither in favor nor against judicial term limits. Other advocates of term limits argue that they would reduce the divisive politics of Court appointments. . . . Crowe and Karpowitz are skeptical, and I tend to agree. I doubt that presidents, Senators, interest groups, and others would suddenly stop caring as much if justices served only 6 or 8 or 12 years. John seems to be making a reasonable point here. With the current partisan polarization and the current huge power of the Supreme Court, it makes sense to see ideological battles over judicial nominees. The surprise, maybe, is that this hasn’t happened more already. The last argument is that the Court would benefit from youthful vigor. Advocates of this argument also point to the decline in mental acuity that some older justices have faced. Crowe and Karpowitz note, however, that if acuity is the criterion, then term limits are a not an ideal solution, since mental decline could strike even at a younger age. Coming up with an acuity test for justices would be challenging, to say the least. I don’t buy this argument at all. Yes, mental decline could strike even at a younger age. But there’s a correlation with age, no? It seems silly to dismiss this argument just because the correlation isn’t 100%. Beyond this, one argument I’ve heard for term limits is that, under the current system, presidents are motivated to nominate youngsters because then they can be on the court forever. With a fixed term, this motivation would be reduced (even if not completely removed). Andrew Gelman and John Sides have an interesting exchange about the merits of creating fixed tenure for Supreme Court justices. I agree with Gelman that seems like a case where Sides is suffering a bit from an occupational hazard of political scientists confronted with proposals for reform—proponents oversell them, and political scientists become unreasonably skeptical in response. At any rate, I’m a proponent of this reform. The strongest argument I can make in favor is that it would create a less-random relationship between election outcomes and the composition of the judiciary. Right now, if John Roberts and Samuel Alito decided to go out on a double-date with their wives, and a drunk driver hits their car killing all four passengers, Barack Obama would wind up reshaping the course of American law for decades. If instead he merely found himself appointing replacements to serve out their terms we’d much reduce this kind of arbitrariness. Then there are two related points. One is that the current system creates too many incentives for a physically or mentally incapacitated justice to try to hang on to his seat until someone more ideologically congenial gets into the White House. Conversely, the current system causes the age of a nominee to loom too large in the decision-making calculus. In exchange, life tenure accomplishes basically nothing that a longish fixed term plus a pension wouldn’t accomplish. America makes it hard to tinker with the constitution (a mixed bag, in my view) so this almost certainly won’t happen unless some turn of events focuses national attention on the potential problems embedded in the current system. But I think making the point that this is a bad system is important anyway, since there’s always the risk that foreign countries engaged in democratic transitions will decide to emulate our model. As I’ve said, I tend to be very conservative about institutional design. I’m suspicious of Seligism — Bud Selig, the current baseball commissioner, is constantly supporting changing long-standing design because some minor flaw turned up, without stopping to consider how various portions of the design are interrelated, or that minor flaws are inevitable regardless of design. I’m even more suspicious of those who turn frustrations with losing in a democracy into enthusiasm for changing the system. On the other hand, I’m not against all reform. Serious institutional breakdown, especially with a good case for inherent design flaws, should be met with reform — the current most obvious case within American politics is California, with its impossible budget politics and destructive initiative process. Another reason to support reform is when the underlying reality that the rules are designed for changes, so that stable rules yield an unstable political system. One can make a pretty good argument, I think, that lifetime appointments for Supreme Court Justices fit that last category. As Linda Greenhouse reported back in 2007, the actual length of terms for Justices has gone up dramatically since 1970 (from an average of about 15 years before then to an average of about 26 years since). Since life expectancy continues to grow, I expect that number to only continue to increase in the future. And the longer each appointment lasts, the more valuable it becomes, which pushes presidents to choose younger and younger nominees (although I think we’re fairly close to the lower limit on that). Elena Kagan, should she be confirmed, may well be on the court for forty years. At some point, I think that’s a very different system than that the Constitution envisioned. As far as the advantages and disadvantages of the present system, Yglesias identifies two problems. The first one, which has to do with the process in which Justices are groomed and selected, doesn’t really bother me much; as far as I can tell, the most recent selections under Bill Clinton, George W. Bush, and Barack Obama are all highly qualified and capable, so I’m not really worried about what they had to do to get there or about those who were blocked because the system works against them. It is true, however, that the high value of each pick creates incentives to selected a certain kind of nominee: young, ideologically reliable, and ambitious enough for the Court that he or she has known from an early age to avoid saying potentially controversial things. The second problem is that the system produces a lot of random results. I do think is a serious flaw. There’s no reason that the election of Jimmy Carter (who had no Court openings) should be worth less than George H.W. Bush. Nor is it reasonable that a president can be far more influential because his nominee lives another forty years, while that of another drops dead after a decade. Both of these always existed, but they matter far more when average tenure doubles. The third problem is that it’s not exactly clear why the results of elections decades ago should have so much influence in governing us today. Justice Stevens was nominated by President Ford (and for what it’s worth, that’s Unelected President Ford) and confirmed by an extremely liberal Senate. And then Americans elected Carter, and then Reagan, and then Bush, Clinton, Bush…and still, the dead hand of the 1972 presidential electorate and the 1970, 1972 and 1974 electorates and the Senators they chose controlled 1/9th of one of three coequal branches. Abortion is important, right? Roe vs. Wade was decided after Nixon was reelected, and after two-thirds of the Senators who confirmed Stevens were chosen. Of course, the nature of the Constitutional system, including not only lifetime judicial appointments but also long terms for the president and Senators, imply that the Framers intended at least some of our past decisions to govern the present and the future. But again, at some point a difference in degree becomes a difference in kind. Actually, it does counter the argument, if the proposal is rotating eighteen-year terms. Yes, mental decline could strike even at a younger age. But there’s a correlation with age, no? It seems silly to dismiss this argument just because the correlation isn’t 100%. It just seems to me that term limits are a pretty blunt instrument for ensuring mental acuity. See also Frank Cross’s comment. …a less-random relationship between election outcomes and the composition of the judiciary. …the current system creates too many incentives for a physically or mentally incapacitated justice to try to hang on to his seat until someone more ideologically congenial gets into the White House. Conversely, the current system causes the age of a nominee to loom too large in the decision-making calculus. Let’s tackle these in reverse order. This concern about the emphasis on young nominees is ubiquitous — see also Jon Bernstein and commenter Zorro for the Common Good. But the average age of the nominees isn’t really any different now than in the past. Go to p.801 of the Calabresi and Lindgren piece that James Fallows cites in his post on this subject. The average age of nominees was lower in the initial years of the Republic (about 48), but since then it’s varied between 52 and 57. The average in the period from 1971-2006 is 53 — down a little bit from the first half of the 20th century, but no different than it was for most of the 19th century. I doubt it can go much lower. It’s hard for potential nominees to be seen as sufficiently qualified for the Court otherwise. On the incentives for an incapacitated judge to hang on. It seems likely that this happens every once in a while. How serious a problem this is, I really don’t know. In my previous entry I framed John’s skepticism about term limits as an example of a more general pattern of political scientists being all too ready to dismiss proposed reforms, perhaps in reaction to the overselling of such proposals by activists. I see political scientists, as a group, as often being too committed to whatever the current system is, for example pooh-poohing campaign finance reform because it can be evaded or dismissing open primaries because there’s no convincing evidence that they will get rid of partisan polarization. In contrast, I often feel that a reform can be a good idea, even if it doesn’t solve all the problems.it’s intended to address. For example, I think gerrymandering is way overrated as a political problem—in 1994, Gary and I even wrote a paper called Enhancing Democracy Through Legislative Redistricting in which we showed that existing redistricting (gerrymandering and all) led to more competitive elections—but I’d still support a move toward nonpartisan redistricting. From the other direction, though, it can make sense to ask why a particular reform is being suggested at a particular time. In some cases, it’s clear: for example, the recent proposals to change Senate rules are a direct response to the sharp increase in the use of the filibuster in recent years. I’m not sure if there’s anything so topical motivating the Supreme Court discussion; maybe it’s just an issue that comes up from time to time. In any case, in response to my generic reaction that John is being a typical political scientist by reflexively dismissing a reform proposal, John might well respond that I am showing the generic reaction of naive reformers to give a default positive view to whatever flavor-of-the-month reform happens to be talked about by pundits right now. As I noted above, my differences with John on this issue seem more of a matter of emphasis than anything else. Are lifetime appointments and long terms basically OK, given that this system has been in place for more than two centuries (as John says), or would it make sense to change the rules (as I’m inclined to think)? In any case, the data that John and others bring to the table help us to understand these arguments.